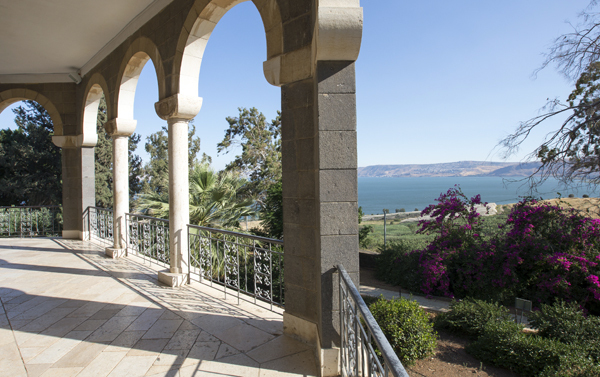 The Church of the Beatitudes sits on a gentle rise overlooking the Sea of Galilee on the spot traditionally believed to be where Jesus gave his Sermon on the Mount, which opens with the eight Beatitudes. This was one of the earliest sermons of Jesus and is generally believed to present the core values of Christian faith. According to the Gospel of Matthew, the Sermon on the Mount happened just after Jesus began his ministry, traveling around the Galilee region preaching and healing. He was developing a reputation as a wise teacher and miracle worker and people began to seek him out. This entry was posted in Bible places, Bible stories, Israel and tagged church of the beatitudes, galilee, Israel by yalla2013. Bookmark the permalink.